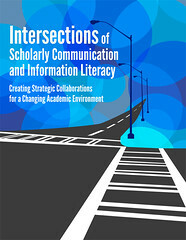 Intersections of Scholarly Communication and Information Literacy: Creating Strategic Collaborations for a Changing Academic Environment, a white paper published by the Association of College & Research Libraries (ACRL). Written by a working group of leaders from many parts of the association, this white paper explores and articulates three intersections between scholarly communication and information literacy. The paper also provides strategies for librarians from different backgrounds to initiate collaborations within their own campus environments between information literacy and scholarly communication.